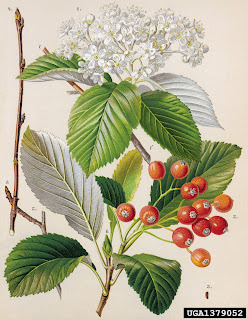 Alder trees -Alnus are a very small group of trees and shrub, made up of only 30 varieties most of which are native to the Northern temperate areas. Ten of which are native specifically to North America half of these can be grown as either shrubs or trees. As a whole, Alders rarely grown to over 70 feet tall. They are relatively fast growers and are short lived not recorded to live very often beyond 100 years. Alders are considered part of the larger Birch family since they are very similar in habit and appearance, however there are two things that set them apart from Birch trees. The first is the fruit of the Alder not only resembles a small cone, but when ripe it becomes hard and woody very much like a cone. The second is that the roots of the Alder grow nodules that house nitrifying bacteria which enables these trees to grow well in bare or poor soils that lack the nitrates the plants need to survive. When the leaves of the trees fall each year and decay they enrich the soil, this enables other tree species to eventually grow in these once uninhabitable areas as well.. Red and Gray Alders are commonly planted along the edges of newly constructed roads and in quarry spoils for this very reason. In its native growth range, the Alder is commonly seen as one of the first signs of new growth in previously burned or logged forests. They are also usefully grown along the banks of rivers and ponds as their root systems will extend down into the water creating a stronger bank and helping with erosion control. The Alders wood is durable in water, it is hard and dense in quality. The wood is also used to make charcoal for gunpowder. It has been used for both bank and canal construction. It is recorded in Welsch Mythology that the Alder fought in the great "Battle of Trees" against the dark spirits of the underworld. When cut the wood of the Alder turns from white to red which is said to signify the tree is bleeding. Native Americans not only made tools and utensils from the Alders wood but they also extracted and used the red dye from it's wood as well. Twigs, leaf buds, leaves and catkins (both male and female) all have medicinal purposes. The Post Oak - Quercus stellata is a deciduous tree that is 32 - 65 feet tall. It grows in an upright erect fashion with generally a single trunk. The crown grows in a rounded form, spreading and ascending, openly branched with a somewhat gnarled appearance. It is native and typically occurs in dry, upland, sandy or gravelly woods, or in dry, mixed deciduous forests from 0-1500 m. The Post Oak can be found from Massachusetts to Iowa in the North and Florida and Texas in the South. The Post Oak has a very high wildlife value, it's acorns provide high energy winter food for Wild Turkey, Whitetail Deer, Squirrels and other small woodland rodents. The trunk cavities provide good nesting sites for birds and small mammals. The leaves, buds and acorns are however toxic to cattle, sheep and goats. The Post Oak is most easily identified by its cross shaped leaves with rectangular lobes. The leaves are alternate, simple and vary in size, they are U shaped or tapered at the bases. The upper leaf surfaces are lustrous, dark green and have the texture of a fine grained sand paper. The fruit is an acorn with a cup ranging in size from 7-18 mm deep, this cup encases 1/3 - 2/3 of the nut. The acorns are generally a light brown in color and are egg shaped or rounded. The bark is grayish in color, dull, irregularly furrowed and moderately scaly. The buds are a reddish brown in color and egg shaped or rounded. The Post Oak can be planted anywhere in hardiness zones 6-9 (about half of the United States), though it is not Native to all of these areas. The branches of the trees begin to droop with age and will require pruning/elevation to maintain clearance for traffic and pedestrians below. The Post Oak will require minimal pruning in order to develop a strong structure. It prefers full sun, and has a high tolerance to drought and various soil conditions. The wood is often marketed as White Oak when sold as firewood. The Persimmon Tree-Diospyros virginiana is a small to medium sized deciduous tree. The female flowers are white and sweetly scented growing in almost a bell shape singly at the base of the leaves. Males flowers look similar, however they grow in cluster of 2 or 3 on separate trees. The persimmon grows many habitats, roadsides, old fields, and forest clearings. The fruit is round orange to purple brown, stalkless, soft and juicy when ripe. When not ripe the fruit is extremely astringent, and horrible to the taste. Introduced species of persimmons with larger fruit are also commonly cultivated. The Texas Persimmon has black fruit that stains the hands and mouth when handled. Persimmon fruit is renowned for it's health benefits. The fruits are very high in vitamins B & C. They boost your immune system, improve iron absorption and have twice the dietary fiber of Apples. 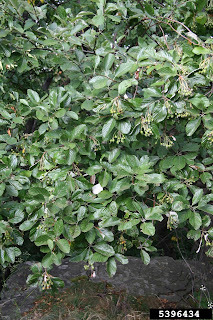 The Cockspur Hawthorn - Crataegus crus-galli is distinguished by the combination of unlobed, short stalked, hairless, lustrous, and dark green leaves. It is a small deciduous tree that reaches heights of 30 feet on average. It grows in an erect, typically upright form with a broad rounded crown. It is native to the entire East Coast with the exception of Southern Florida, West through Texas in the South and Michigan in the North. It is most commonly found growing in thickets, woodlands, bottom lands, pastures and stream beds. It is among the most common and widespread of all the Eastern Hawthorn, found in all but three eastern states. The bark of the Cockspur Hawthorn is full of stout, gray-black, straight or curved thorns. The leaves are alternate, simple, narrowly obovate, thick, leathery, with a rounded base and blades 2-8 cm long. The flowers are circular, with white petals, 10 - 20 stamens, occurring in Mid-Spring. The fruit is a greenish pome, that becomes red with maturity. The fruit is rounded or oblong 8-15 mm each, maturing in Autumn. 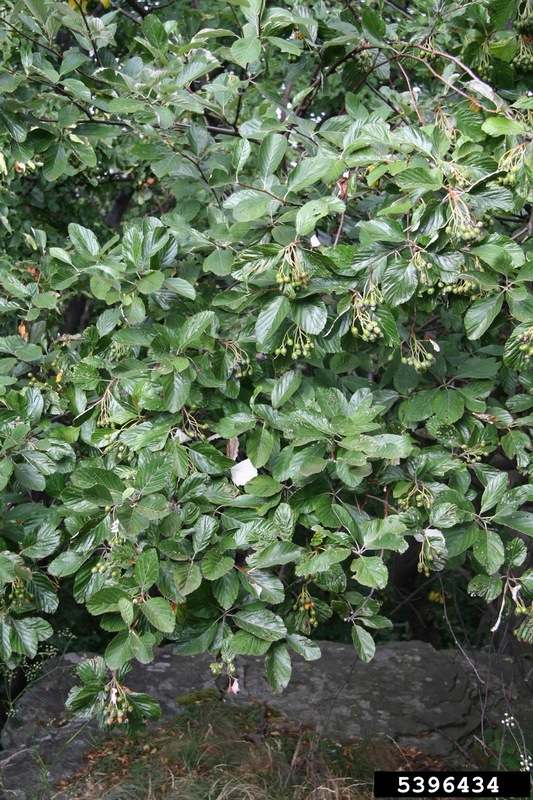 The Cockspur Hawthorn is a very popular garden tree and is used in not only residential applications but also commercially and along roadsides. It is recommended for hardiness zones 4-9. Cockspur Hawthorn prefers moist, well drained, slightly acid soils, and full sunlight. It is adaptable to poor soils and various soil pHs, compacted soils, drought, heat and even limited winter salt sprays. This tree provides excellent cover and nesting areas for many small varieties of small birds. The fruits are eaten by birds, including waxwings, sparrows, grouse, and small rodents. The twigs and leaves are eaten by white tail and mule deer. The Loquat - Eriobotrya japonica is most easily recognized by the combination of large coarsely toothed, heavily veined, dark green leaves and large flowering panicles with yellow or orange fruit. It is an evergreen shrub or small tree that reaches heights of 9-20 feet high on average. The crown is dense, rounded and somewhat vase shaped. The Eriobotrya is a small genus of only 30 species of evergreen shrubs or trees that are native to mostly Asia. The bark is brownish gray, smooth and somewhat hairy. The leaves are alternate, simply toothed, stiff, leathery, obovate or elliptical, with coarsely toothed margins and parallel veins. The upper leaf surface is lustrous, dark green, hairless, with a paler lower surface. The flowers are 10-15 mm in diameter with 5 petals in an oval or circular form. The flowers are a creamy white color with a sweet fragrance, borne in conspicuous branches and hairy terminal panicles. The flowers appear is late Autumn to early Winter. The fruit is a yellow, orange or whitish pome, that is pear shaped or oblong with 1-2 large seeds. The fruit matures in Spring to early Summer. The Loquat was originally introduced from East Asia and is now found on disturbed sites from South Florida to South Louisiana, and cultivated into the southern portion of North Carolina. The Loquat is considered to be somewhat invasive in some portions of Florida. Common Apple - Malus pumila - Trees are small deciduous trees in the Rosaceae family with a single erect trunk and low hanging branches that often reach the ground. Sometimes also called Paradise Apple, this is the Apple of commerce. Numerous cultivars have been selected from this genus for taste, size, shape and color. Fruits of wild plants are often of lesser quality then those that are tended to in orchards. Other varieties of Apples and Crab Apples have smaller fruit and thorny twigs. The fragrant flowers are white with a hint of pink or sometimes all pink. Flower have 5 petals and appear with the new leaves in mid - late Spring. The leaves are alternate, simply shaped, oval or elliptic with a bluntly pointed tip. The upper leaf surface is a deep green hairy when young, becoming hairless with age. The fruit is round or slightly ellipsoid pome, green when young becoming red with maturity. The fruit matures in Summer to Early Fall annually. Growing commonly in forest clearings, near streams in the Eastern United States (but not very far to the North or Gulf Coast region). Ornamental varieties are grown throughout the majority of the United States. It is believed that the Common Apple was originally introduced from Asia or Europe but has naturalized in many areas within it's hardiness zones. Avocado fruits are climacteric, meaning they mature on the tree but don't ripen until taken off. They will only ripen if mature, so if picked early the ripening process will not occur. The Banana is another fruit in the climacteric category. Most Avocado crops produce the best crops bi-annually with poor yields in the off or in between years. Once off of the tree the fruit will ripen within a two week period, if left on the tree to long the fruit will eventually fall off on it's own. Avocados can be grown from seed, although it will take the new plantings 4-6 years to mature and bear fruit. Indoors you can also grow Avocados from the pits in water, holding them near the surface with toothpicks, once the stem reaches an inch or two you can transfer it to soil. Pumpkin Ash - Fraxinus profunda - The combination of buttressed trunk base, large pinnately compound leaves with 7-9 dark green leaflets and samara fruit make this species easily identifiable. Pumpkin Ash is a deciduous tree that reaches heights of 35-90 feet tall, growing in an erect form with a single straight or crooked trunk. It is native to swamps, old lake beds, freshwater tidal wetlands, floodplains and wet woodlands along the Mississippi and Ohio rivers from Michigan south through Louisiana and along the Eastern seaboard from New Jersey south through Florida. The Pumpkin Ash is often times confused with the Water Ashes in the Carolina Ash family. Leaves are opposite, pinnately compounded with blades 20-45 cm long, rachis 8/15 cm long, 7-9 leaflets ovate in shape, narrowly oblong or elliptic. The upper leaflet surface is dark green and hairless, the lower surface is hairy. In the fall, the foliage turns bronze to reddish purple before falling off to make way for the next years foliage. The bark is light gray with interlacing ridges. The swollen or "pumpkin" like trunk base is visibly apparent on some trees, especially those growing in deep swamp areas in the Southern growth range. The fruit is in the form of a samara 4-7 cm long and up to 14 mm broad. The fruit range in shape from narrowly linear to elliptic, with a wing arising from the base of the seed body. The fruit matures in early Autumn. Best suited for hardiness zones 5-9, Pumpkin Ash prefers moist to slightly dry soil. It grows well in deep, loamy soil and swamp areas. Birds and small mammals feed readily on the seeds produced by this tree. It also provides cover and habitat for birds and other wildlife. The larvae of the Emerald Ash Borer feed destructively and can kill this species. Flies and caterpillars also will feed on the foliage. The London Planetree- plantanus x acerfolia - is a hybrid of the Sycamore and the Oriental Plane. London Planetree are large deciduous trees that reach heights of 65-100 feet when mature. It is one of the most commonly planted street trees in the United States because of it's high tolerance to both polluted air and limited rooting areas. It possesses a very strong hybrid vigor and grows well in almost all locations, but is not very tolerant to extremely low temperatures. It has a fairly long life expectancy and in many cases "outgrows" it's location by lifting sidewalks and other surrounding obstacles. Thought to have been originally grown in Spain during the very early 17th century. It is recorded in both France and Spain around 1650, and in England from 1680. One of the diseases that has known to significantly effect London Planetrees is Cankerstain. Thousands of London Planetree have died from Cankerstain in the Eastern United States since the early 1930's. Cankerstain is caused by the fungus Ceratocystis fimbriata. The fungus enters the trunk or branches through weakened areas such as injuries, or saw cuts and moves inward from there. Once infected death of the entire tree usually occurs within a year or two. Diseased trees should be removed and destroyed as soon as diagnosed to prevent spread. The London Planetree is also succeptable to Lacebug, Plum Borer and Anthracnose to name a few. London Planetrees are often pruned using a technique called pollarding. A pollarded tree has a very noticeably different appearance than an unpruned tree, it will appear much shorter with stunted, clubbed branches. Pollarding requires frequent maintenance (the process must usually be repeated annually), it creates a distinctive shape that is often sought after in plazas, parks, main streets, and other urban areas where overall size and appearance is of great concern. The Swamp White Oak - Quercus bicolor is an attractive deciduous shade tree. Even though it is named Swamp White Oak and is similar to the White Oaks, it is actually a member of the Chestnut Oak family. It has beautiful fall coloring that ranges from Orange, Gold and Yellow in mid-Autumn. With a broad open crown, rounded form and a short trunk it makes for a sturdy medium sized shade tree. It is considered one of the easiest Oaks to transplant and is tolerant to salt, drought, heat and poor drainage. It has good visual interest in Mid Winter, Early Summer and Fall. The leaves are lobed and have an almost two toned appearance, during the early growing season they are a dark green on top and a silvery white on the underside becoming green all over by the summer months. The leaves grow alternately and are coarsely toothed/lobed with variable margins. The bark is a pale grey with networks of thick coarse blackish grey ridges, becoming a dark grey when mature. The acorns are 1 inch long and enclosed in a warty cap, this cap often remains attached to the stalk once the fruit is ripe and falls from the tree. It is recommended for zones 4-8 and is available at limited nurseries in it's growth zone. Be wary of soils with high pH as this tree does show signs of chlorosis (yellowing) with high pH. The "Southern Magnolia" - Magnolia grandiflora - is a medium sized evergreen tree. It is also called the Bull Bay, Big Laurel, Evergreen Magnolia or Large Flower Magnolia. The native range of the Southern Magnolia goes from North Carolina south down the Atlantic Coast and through Georgia, Alabama, Mississippi, Louisiana, and Central Texas. Averaging 60-80 feet tall in ideal locations, they usually reach maturity at 80-120 years. It typically grows in an oval pyramidal shape. Featuring leathery leaves 5–10" in length, with a lustrous dark green top and soft, rusty underside. The large White fragrant flowers appear April-June and are almost perfect in form. The fleshy cone shaped fruit mature in late fall. The fruit are 5-8 inches long and attract a wide range of wildlife including Squirrels, Rabbits and Birds. Recommended for zones 6-10 this variety can be grown as far North as Maine and is found planted over most of the country with the exception of the North-Central Region. Air-layering, stem cuttings and grafting are all successful means of propagation. It can be found at most nurseries in it's growth range. It is best planted as a landscape tree versus a street tree as the leaf, flower and fruit debris are often considered messy. The name Magnolia honors French Botanist Pierre Magnol, who was so impressed with the tree he transplanted one near his home in Europe over 300 years ago. One of these trees grows on the White House grounds, it was transplanted by President Andrew Jackson from his home in Nashville, Tennessee. This tree was transplanted to honor his late wife Rachel's memory. 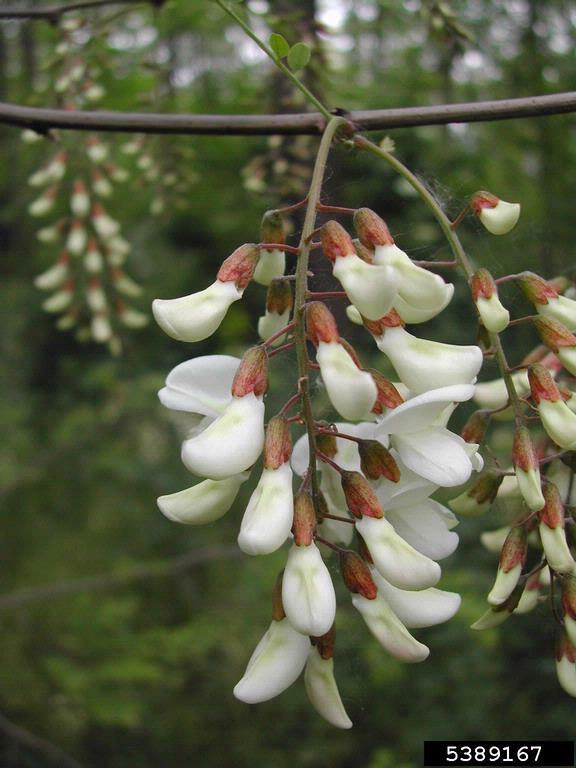 The Black Locust - Robinia pseudoacacia, is most easily recognized by the combination of hanging clusters of creamy white flowers, pinnate leaves subtended by a pair of sharp pointed spines and coarse ridged or furrowed blackish or deep brown bark. Black Locust is established in the moist woods, stream margins, river bottoms and Mountains in most of the United States, the Southern most portions of Canada and some parts of Europe. Believed to have a native range from the Southern Appalachian to the Ozark Mountains. Similar in appearance to the Clammy Locust and Bristly Locust, with their only difference being flower colors of pink to rose-purple. 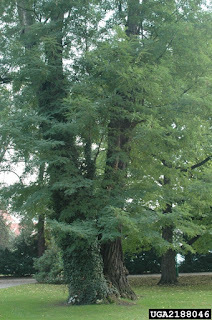 The Black Locust is a deciduous tree that can reach heights of 75 feet tall in ideal conditions. Generally forming a single straight trunk, open irregular crown and ascending branches. Occasionally taking on a spreading form when grown out in the open. The bark is dark in color ranging from gray to dark gray-brown or dark brown to black, with coarse ridges or deep furrows. The leaves are alternate, pinnate, with blades ranging from 20-36 cm long and 4-12 cm broad. The petiole averages about 3 cm long and is subtended by a pair of sharp pointed spines (thorns). Leaflets occur in numbers of 7-25 generally in odd numbers, thin and elliptic in shape with a rounded or bluntly wedge shaped base, and tipped with small teeth. The leaf surfaces are medium green to yellow green. Flowers are bisexual, fragrant and white to creamy white in color with small dull yellow patch on each. The Calyx is 6-9 mm long, corolla is 1.5-2.5 cm long, produced from the leaf axils in an elongate drooping raceme. The flowers occur in Spring to early Summer annually. The fruit is an oblong, flat legume 5-10 cm long and about 1 cm broad. Fruit matures in late Summer to early Summer annually. Common Buttonbush - Cephalanthus occidentalis is most easily recognized by the simple, whorled or opposite leaves and creamy white globe like heads on it's tubular flowers. It is a deciduous shrub or small tree that ranges in height from 9-45 feet on average. This variety grows in an erect upright fashion with a single main trunk, open crown and vase shape. It is native to The United States and can be found growing in all but 10 states (those 10 are Washington, Oregon, Idaho, Nevada, Montana, Wyoming, Colorado, Utah, North Dakota and South Dakota). It is primarily found in swamps, wetland depression, stream banks, lake and pond margins from the East to the West coast. The bark is smooth when young becoming rigid and furrowed with age. The leaves are simple, whorled or opposite, lanceolate or elliptic with a wedge shaped base. The upper surface is lustrous and dark green, the lower surface is paler with conspicuous veins. The flowers are bisexual, creamy white and tubular, produced in large numbers in globular, pendant or ball like heads 2-4 cm in diameter. The fruit is a capsule like shape 5-8 mm long, maturing in Summer to early Autumn. The Common Buttonbush is vegetatively similar to the Georgia Fever Tree (Pinckneya bracteata), both are found in wetland areas. They are best distinguished from one another by the differences in flower and fruit. The Zelkova - is a deciduous tree in the Elm family that is native to Europe and Southeast Asia. 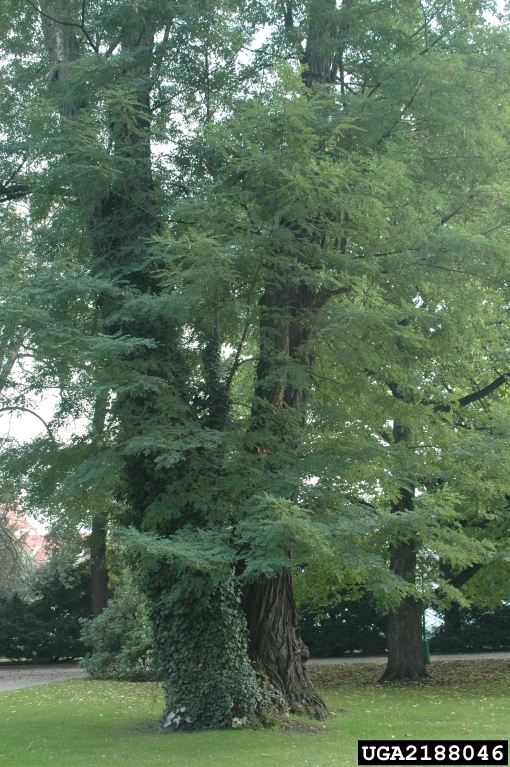 It is suceptible to Dutch Elm disease but most often survives it, this is one of the main reason why it is considered to be a replacement for the Elm tree. With a vase shape and the ability to grow 90-100 feet tall with a 60-80 foot spread. It has a moderate growth rate and thrives best in ful sun locations. The leaves are 1 1/2 to 4 inches long, green when young and turning a brilliant orange to burnt umber in the fall. This trees crown grows in a vase shape very similar to that of the Elm. The leaves are a simple shape with serrated edges. There are not obvious flowers on this tree they are very small and inconspicuous. The Zelkova grows in a variety of soils but prefers moist deep loams. Established specimens are highly drought resistance. This tree makes for an ideal street tree as they thrive even in pits that were they soil is restricted. It also has a high disease and salt resistance. This tree thrives in zones 5-8 and is readily available from most local nurseries. It will make for a sturdy addition to any landscape. The Zelkova - is a deciduous tree in the Elm family that is native to Europe and Southeast Asia. It is susceptible to Dutch Elm disease but most often survives it, this is one of the main reason why it is considered to be a replacement for the Elm tree. With a vase shape and the ability to grow 90-100 feet tall with a 60-80 foot spread. It has a moderate growth rate and thrives best in full sun locations. The leaves are 1 1/2 to 4 inches long, green when young and turning a brilliant orange to burnt umber in the fall. This varities crown grows naturally in a vase shape very similar to that of the Elm. The leaves are a simple shape with serrated edges. There are not obvious flowers on this tree they are very small and inconspicuous.